Digital Innovation, in today’s world is a must-have for the smooth functioning of a law-firm. Technical know-how is also an absolute necessity to keep track of all the work and progress of employees. Digital Innovation provides multi edge advantages in the operations of a law firm. Be it client management, cost operations, analytics of firm performance or easy data access. Digital Transformation is the path to easy management and increased efficiency. Especially in mid-sized firms, where the client base is large, employer-employee relationship is not direct, inflow and outflow is frequent, these tech-mantras come handy! 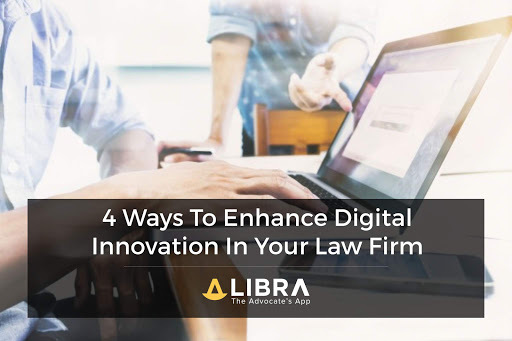 Here are some simple yet efficient ways to bring digitalize technical innovation and bring optimum efficiency home with the new legal softwares. Before we get into the intricacies of getting this done, remember to have the correct technical help for your firm. Technical glitches might not only stagnate the work but also demotivate employees and clients from using it. In order to pitch the talent of the newer generations, it is best to have the most sorted and quickest technology in place. Digital To-Do Lists: The best way to do is to have a weekly tasks for yourself and your employees. Digital to-do lists are available that will let you check your employee’s task-list, let you add or update to it. Having a to-do list is a constant reminder of your priorities. Chasing deadlines is one of the easiest way to finish your work on time. Digital to-do-list also lets you check the progress of your employees and case hearings! This way you do not need to keep taking updates from all your employees, rather you can just skim through their task lists. It is an efficient way for larger firms where one to one communication on a daily basis is not possible. Online Data Sharing– Data sharing and security is the key for the operation of any law firm. Law Firm operations are all about research and case-building. Research generally requires a lot of background studying, especially with the age-old and never ending case-laws. It is always better to share research and the easiest way to do is by taking the data to the cloud, available in most of the legal softwares (eg: Libra). Online data sharing, via cloud or Google Drive, allows you to make a database of all the past research. This makes it an easy way to access legal data and thus it doesn’t require you to go over the cases all over again. Turn data into research material; store, share and secure! Adopt a Client Relation Management: Clients are the very driving force behind a successful functioning of a law-firm. It is always necessary to have an effective way to client management. Technical advancements allow to have separate profiles for clients and efficient management of their affairs. Every case goes through different stages, it is important that the firm is updated about the progress of every client’s profile. Legal Softwares today provide for a client relation mechanism, as a one-stop-shop to record all data in one place with easy and quick access. Technical innovations give you a wide variety of options to build a CRM as per the specific requirements of the firm. Customer oriented firms have an edge over competition during market-shifts. Instant Communication: It is always good to have a quick and efficient way to communicate with employees, colleagues and clients. Having a separate platform for communication, allows to keep the unnecessary hassle off. Plus, having a formal platform allows on-point communication which increases productivity. Such mechanisms allows you to have one-on-one messaging as well as different groups for broadcast messaging. These platforms can also be used to communicate with existing and potential customers. The best way to spread the word around with the latest services of the firm. Digital Innovation will render you unexpected results in the performance of your law-firm. It will ace up you research, client management, expense tracking, case hearings and a lot more. Having the latest technology and putting them in use allows you to keep pace with the changing market shifts. It is also important to catch up with the rising competition in the market. Clients prefer a quick, transparent and efficient way to their legal issues. All of which can be brought about in a single-click! Always keep in mind that digitization surely provides you an edge, however not alone. It is important to train all the employees to be able to the use the technology in place and bear the best results for the firm.